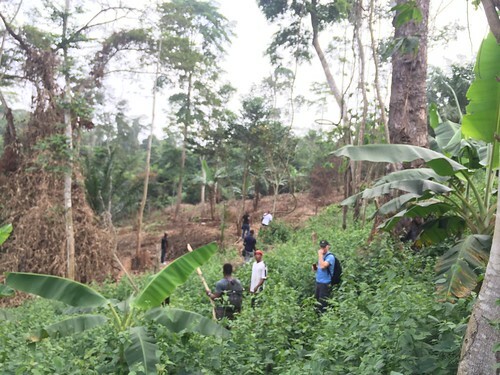 On December 26, 2016, I spent 03 weeks in Cameroon – a country in Central Africa – to launch a project that our team set on carrying out more than 15 months ago. It was our aspiration to propose concrete solutions for this era dubbed economic post-growth. For him, it is impossible to picture today and tomorrow’s world without the help of technology. Our role as agent of change does not consist in changing the world. But to rather provide the means for others to effect that change. It was frustrating to be unable to spur a concrete impact in our environment despite our believing in the power and mechanism of ideas, we however launched a pilot project of a green village under open innovation. The smart town or village has to be a constant environment for innovation based on the principles of collaborative economy where all the advantages of technology help along – not the financial wealth of the community -, but the common good rather. 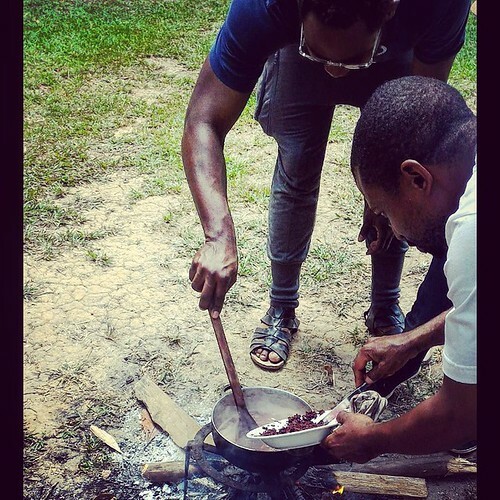 Our stay in Cameroon therefore marked the crystallization of this thought initiated 15 months earlier and the achievements of findings from works begun at Montréal last June. Time is short for us to explain in detail the concept of “Economic Post-Growth” here. For this reason we recommend Marie-Monique Robin’s well-researched documentary: Sacrée Croissance (Economic Growth: What Next ?) . Let us draw on this side story to better understand what this is all about: It is difficult for humans to buy Happiness. Since Happiness cannot be bought, consequently it is not the result of a financially payable effort. While the majority of economies in the world bring their respective inhabitants together by federation on concepts, like the GDP or economic growth, that are complex to the layman, it is much easier to lead a happy life in a small village community by keeping good relations with one’s peers and by avoiding excess consumption, rather than focusing on growing the “financial wealth” of individuals. The Postindustrial trend calls for reflection on our lifestyle in a society where resources will become rare and limited, with some countries compelled to depend on loans. Il n’est plus nécessaire de parler de l’Afrique dans son ensemble car les pays Africains sont très hétérogènes en général. 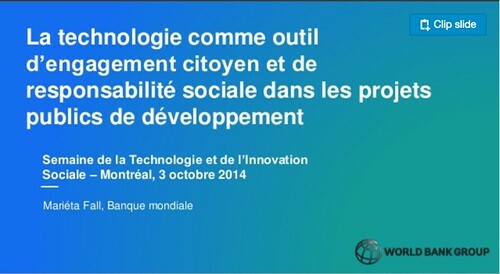 La mosaïque culturelle, économique et sociale se vérifie aussi lorsqu’on parle des technologies. Internet access is indeed not even in all African countries as shown by TIU figures in the (graphic below) . 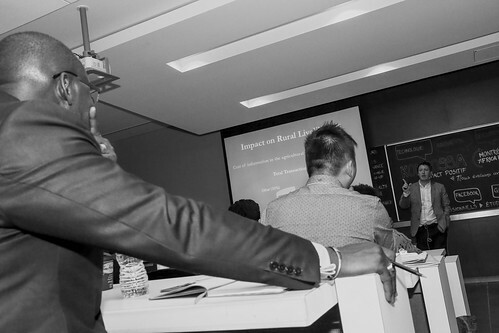 Although Africa’s youth yearning to be the next in line to join this great global web family can be felt everywhere. Countries like the Seychelles, Morocco or even South Africa are topping the list. Cameroon occupies the middle position in this internet race. It is moreover preferable to assess internet access in Africa by carrying out a survey on the number of mobile subscriptions per 100 inhabitants given that, phone is the most common communication device. 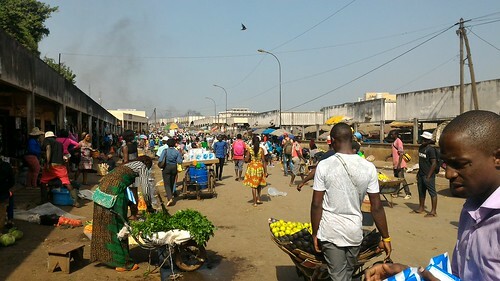 In precisely the case of Cameroon for instance, a great gap can be observed between the number of people who were connected to the internet at least one time in 2015 , that is about 20% of the country’s population, and the number of mobile internet subscription per 100 inhabitants which lies at 4.1% instead. My theory is that large towns like Douala and Yaoundé with their additional 4 million inhabitants have contributed a lot in modifying these figures. In my opinion, this gap is an opportunity to exploit. Cameroon’s population is estimated to be 24 million. Facebook users make up about 8.6% of the overall population. Agricultural production should register an increase of 70% by 2050. 805 million people suffer from malnutrition across the world. 1.5 billion hectares are used for farming, whereas 3.4 billion are reserved for grazing. Agriculture and rearing were emitting the equivalent of 5.3 billion tons of C02 in 2011, which is to say14% even more than these two activities were back in 2001. 39% of these emissions come from enteric fermentation – the methane emanating from the digestion process of ruminants. In this vein, the world food system needs to be thought over. Experts and renown farmers like the Quebecois Jean-Martin Fortier propose a territory-based food system , which is part of small and medium size food companies geographically similar to large scale family plantations. Cameroon is located in Central Africa, deep within the Golf of Guinea. The country covers a surface area of 475 650 km2, with a seaside opening of 402 Km on the Atlantic coast. A tropical and dry climate prevails at the northern part of the country, contrary to the equatorial and humid one found in the south side. Volcanic eruptions have – in the repeated process of reshaping the terrain predominantly made up of lowlands and plateaus – given way to a few mountainous mass amongst which Mt Cameroon. Measuring 4095 m in height, the latter is still active and counted among the highest mountains in Africa. 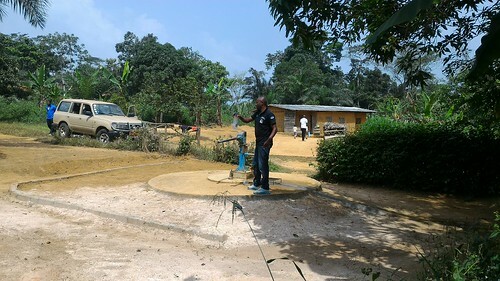 The water system in Cameroon is largely diversified. Cameroon’s population is estimated at 20.386.800 from the 2012 census, women making 51%.of that figure. This population grows at an annual average rate of 2,8% and will likely peak 26,5 million in 2020. Based on the population census of 2010, 58, 2% of its people live in urban areas averaging a density of 42, 3 inhabitants per km2. About 66% of the population occupies 22% of country’s surface area. The urban population grows at an average rate of 5, 7 % yearly. The population is mostly made up of youths : about two third of its people are aged below 25 and those below 15 make up 45% of the overall population , contrasting with the remaining 3,4% representing older persons above 65. Unequal territorial distribution, youths and the extremely high growth rate of the overall population coupled with urbanization are the many socio-demographic challenges this country is tackling and which several analysts have dubbed ‘the demographic challenge’. The rural sector accounts for about a third of the GDP while generating half of the revenues registered in the export of non-petroleum products. This sector harbors 63% of the active population and sustains about 70% of the general population. 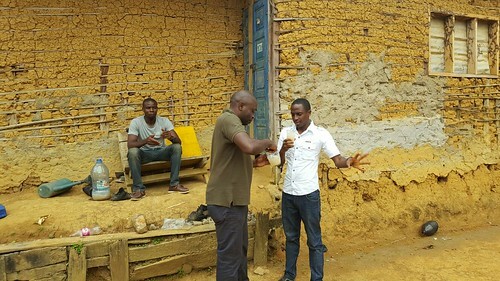 Moreover, the rural area is the pillar of food security in the country by virtue of the product types it is called to offer for the home consumption of 10 million rural Cameroonians and the supplying of food to the urban population estimated at 10 million inhabitants as well. The role this area plays in maintaining a balanced environment and preserving nature is now largely acknowledged. 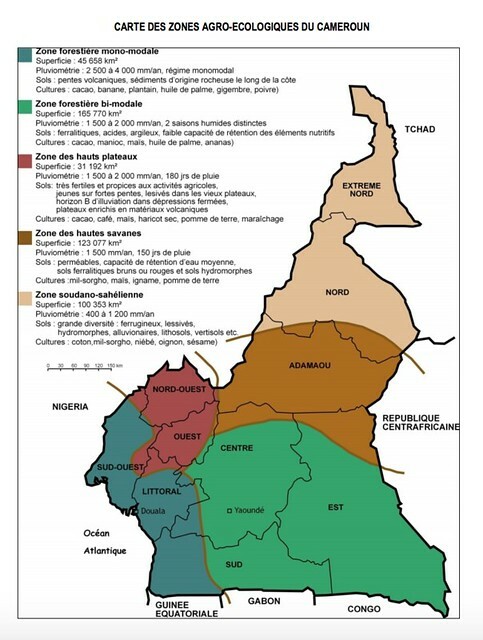 A Great Agro-ecological Diversity: Different landscapes are found in Cameroon; including geomorphological and climatic zones grouped into 5 regional blocks or unique agro-ecological areas. 7,2 million hectares of arable land are available, with only 51% used to farm in 2010, precisely 3,7 million hectares. A diversified and abundant livestock, mainly beef, cow’s milk, goats, sheeps, pigs etc. rivers with abundant fishes, a pretty high potential for sea fishing. High potential to process, produce and increase the value of wood. High potential to restore the damaged forest of regions. − A dense hydrographic network and normal rainfalls despite some reservations made in relation to the northern part of the country in recent years due to drought and inundations. I) The first project aims at improving the agriculture production chain. During his 2013 call to Kongossa Web Series , Laurent Elder shared with us the findings of a study carried out by the International Development Research Center (IDRC). In his analysis he arrived at the conclusion that the best way to positively transform agriculture is to reduce information cost. Very little information flows or is accessible to farmers and farm owners. During our training in Montréal and workshop seminars organized in this city, our team learned that before committing to a large scale agriculture project, it is safe to first try out one’s ideas on a laboratory or test zone . Thus in 2015, our team acquired a piece of land measuring a 10.000 square meters (2.47105 acres) to test our ideas. The test site is located at a 2 hour drive away from Yaoundé on the road leading to the town of Douala, Cameroon’s main economic center. The location of the site on the Cameroon agro-ecological map shows it is likely situated in the bimodal forest region – Center and South West Regions – which totals up a surface area of 165 770 km2. The farmers of this region generally focus on cocoa, manioc, maize, palm oil and pineapple production. 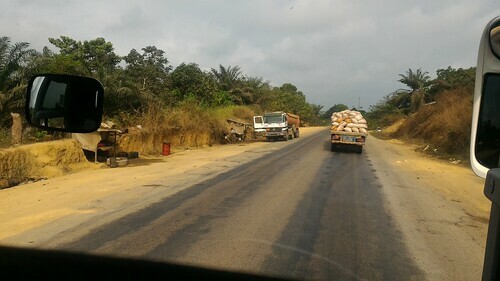 In clear terms, the site is located in a unique geographic position since it shares boundaries with two green areas (See map below) which makes the farming of different crops, including plantain, possible. .
Farm site is located away at a 40 minutes distance walk from the highway toll station. Benefiting from the expertise of farmers and rearers in the region. To be able to get to Yaoundé and its more than 2 million dwellers in 1 hour. Bonding with the local community to understand their modus operandi. Explaining our approach and willingness to collaborate. 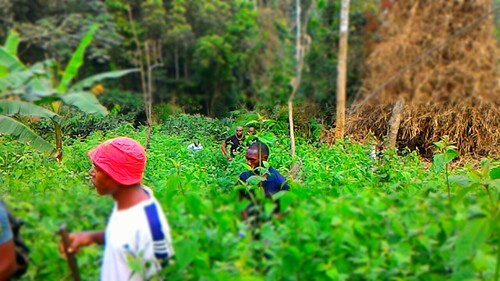 Launching a small plantation in which crops whose farming techniques are well mastered by local peasants would be associated. In that light, priority was placed on the association of plantain and cocoa, the reason being that the region is suitable for this type of crops as mentioned above. 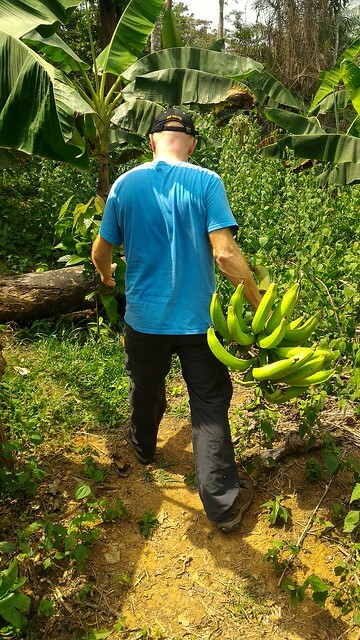 Farm technicians had earlier pointed out to us that we should expect the first bunches of plantain 12 months after planting. I must admit that we managed this project with an open-mind and no real expectation. 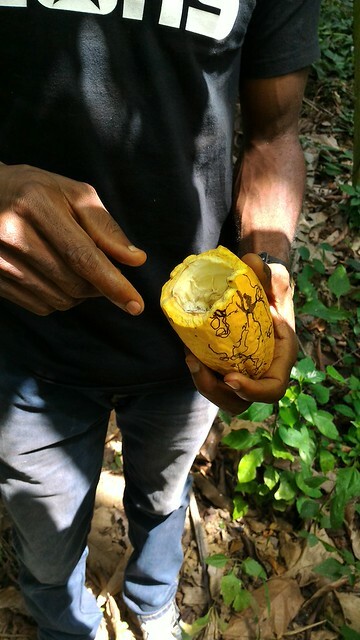 Almost 12 months later and following the streak of errors we made as novice farmers, we have been able to evaluate the various stages of these plantain bunches and cocoa pods as shown in the picture below. In the upcoming months, our farm produce will make their first entry into the market. It all begins at this stage. And this bears proof that the approach we resorted to, works pretty well. After12 months, the exploratory phase can likely be over. 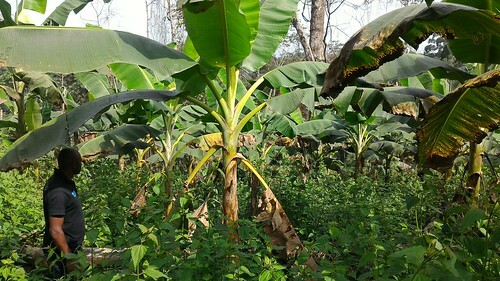 The first plantain trees have begun yielding their first bunches. Peasants and farmers sometimes travel thousands of kilometers for their harvest to reach large urban centers. Agricultural revolution also means decentralization with respect to farm production in a bid to bring farmer close to consumers. This solution should be strongly considered in Cameroon, in addition to building routes to link rural areas to urban centers. Technology plays a big role in this stage. A great deal of traditional techniques do exist, but the processing of subsistence crops is a genuine opportunity for agricultural entrepreneurs. This processing will normally not only create jobs, but spur the development of new means of food distribution and consumption as well. Farmers need international expertise. International cooperation more than ever, namely agricultural knowledge transfer and the useful modernization of orchards is compulsory in order to take up the challenges posed by the expected world population boom. The image below shows a potable water well, bored with the help of international cooperation. It is the primary water source for this community of approximately 500 persons. Ecological Habitat: This year, a new phase of the project will be launched: the ecological habitat. Our dream is to positively change the way in which natives build their traditional houses by making them energy-independent through Information Technology (IT). Gardening: This year will also witness the launching of a garden project alongside an organic garden. The Global Design Of The Site: there are plans to extend the current farm site as well as the overall design of the estate as depicted during our workshop Design Thinking organized on June 2016 in Montréal.